I’m sorry, I just found this post. But I think it was meant to be, because in the past two weeks my mom has been diagnosed with dementia, she’s quite angry with me, and my brother and I found a great independent/assisted living place for her. Your post sang to my heart. Beautiful. Thank you! Thank you for this post, Robin. My mother is 97, and dementia has her living memories as a child on the farm in Missouri, but she’s still my mom. I’m now the keeper of the memories about her–and my dad, who died of Alzheimer’s–by saving them for her great-grandchildren. “Keeper of the memories” is a nice turn of phrase. It would make a great book title! I’m sorry to hear about your mom and dad. Dementia is cruel. How nice that your mom is living in wonderful memories of the past tho. Wow, it’s so tough to see our parents get sick. For so long they’ve been our rocks, and now those sturdy rocks are sinking. I’m really sorry about what you have to go through. But I love your outlook and your attitude. Focusing on the beautiful times with her is hugely important. Happy Mom’s Day! It is tough to see them age and get ill. I just learned that my dad is in the hospital (with good chances of being released in a day or two). Get over one hurdle and find another. I know you know what I am talking about. I think I will do a similar tribute to my dad for Father’s Day. Darn it all! Beautiful post . . . I needed a reminder about teaching my own girls some of those things 🙂 Hugs & prayers for your mom. I just know you have already taught your girls your “Mom-isms.” And they will treasure them. It’s lovely that you’ve remembered the good times and lessons and focus on them rather than the heartbreak of dementia. My mother-in-law suffered from it in her last years, and it was so hard to see her not remember her own children. I hope you had a wonderful Mother’s Day with your family. I figured I could wallow in something sad that I can’t change, or I could celebrate what was. What a cruel, cruel, disease. It takes the person from you before they are gone. So . . . live on the memories! My dad has dementia. I miss him too. Now that he’s in the nursing home, I don’t get a chance to talk to him on the phone like I did. You bring up an interesting idea. Talking to the elderly and their disinterest could simply be that missing link in communication. Huh! So sorry to hear about our dad. How old is he? Mom would HATE that she is in this condition. HATE it! She was not a vain person, but took great pride in making herself look nice, making a comfortable home, tending after her family, and whatnot. If she only knew . . . none of that is happening now, nor will ever happen . . . it would kill her. My mom never danced when she cleared the table, but I still picked up on it somehow. It must be a recessive gene. How did I just KNOW that you are a table-clearing-dancer? Did you get your replacement gerbil yet? There is no way you can replace a dog with a rodent. Sorry. No way. Oh, the rodent thing is my philosophy. I do not expect it to be yours. No. No replacement critter yet. I’m renovating the former rat room. ; once it’s complete, I’ll start looking. Renovating for a new rodent? Now you have taken it too far. Or, maybe you should start a new HGTV show called “Rat-ovations.” Brilliant idea. I think you have found me a new career. I did have a nice Mother’s Day. My husband made a lovely breakfast, I went on a garden tour in a beautiful old neighborhood, and then he made dinner! Perfect day. I’m so glad to hear that. It sounds lovely! Your story is a reminder to make the most of every single day. They go by so fast and we often tend to take them for granted. Best wishes to you Robin. Thank you so much. And best wishes to you too! Yes, the days are fleeting, aren’t they? It is a little scary. Robin, beautiful tribute. Wonderful reminder to us all to look for what is hidden. Awww. Thank you. I think my mom would love the list of the things she gave me. What a great list. I love all that she taught you. You are a very empathetic person..aware, thoughtful, and embracing life, fully. Love the groovy picture. Happy Mothers Day to you,Robin. You are truly one of the BEST! That is so sweet of you to say. Same to you! I hope you have a lovely Mother’s Day and are treated like a princess. Nice reminder. I’m missing my mom, too, but even her shell is gone. You make me feel lucky that she left us with a mind still intact. I’m sorry that your mom’s illness is so difficult on you and all your family. It’s a cruel, cruel disease. Hugs to you. And Happy Mother’s Day to the mother that you are! Cheers! Dementia is cruel. As I said in another comment, she looks perfectly normal/healthy (well, for 91) on the outside. It is hard to come to terms with her being gone on the inside. If she knew/understood what happened to her, she would be mortified. She was proud, but not vain. It is hard to not be mad about it all. Yes, anger is a pretty straight response to disappointment, hurt, a sense of injustice, pain. Dementia thumbs its nose at pride. I have something written into my will that states if I do not know enough to feed myself or know what’s going on around me, then no one is to feed me. A hard call, but I would rather die of starvation than live a life that I would not want to be living. I completely agree. When it is time for me to go, out I’ll go. What a lovely way to put it. Mother’s Day is a chance to celebrate our mothers but also a chance to celebrate what we are made of. Happy Mother’s Day to you as well. I love the things you took away from your mom. My birth mom struggled with drugs and alcohol all her life. Luckily she left our family when I was five, though I did not understand that this was a good thing at that time. She died in her fifties and none of use ever reconnected with her. My dad remarried and at first everything was wonderful but she ended up having a dark side to her which I mentioned in earlier conversations. I actually found comfort hearing of her passing because it meant she couldn’t hurt my sisters anymore. Despite the bad, I could always see the positive attributes, qualities she had that are now part of me. Things that I like about myself and I know that they would not be part of me had it not been for her. As a mom, I have had moments that I am very proud of and some, not so much. It is my hope that in the end, my daughter can see the positive things and be able to take some of that with her. I think we moms all have moments are are proud of and some we wish we could re-do. I’m sorry to hear about your tale of two mothers. I like to think that I also learned what NOT to do from my mom . . . especially in the area of her not being all that interested in her grandchildren. Because she didn’t really care (or at least act like it), I am going to be the world’s most doting grandmother ever. Love that picture. It’s nice that you and your mom were buddies and close during part of your lives. She set you on a good path. While she has wandered off and is hard to see in the mist, she’d be proud of you. 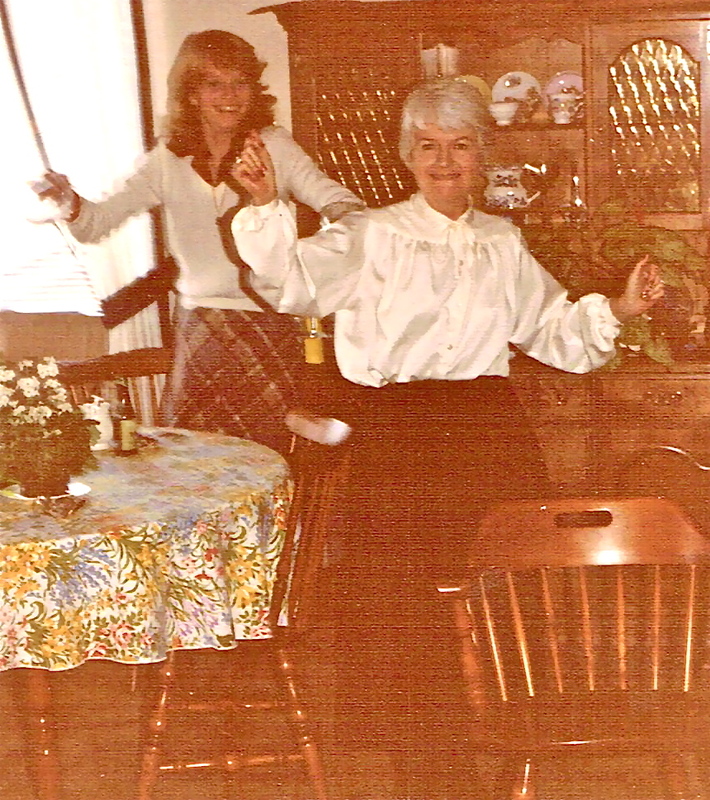 Mom always made family gatherings a party and we often danced in the kitchen while doing the dishes. She was quick to break into song and dance. Even today, she sings and remembers most of the lyrics. The brain is a mysterious thing. Now that’s a line to remember. (and apparently people do. My father-in-law was “difficult” at that point…well, more than that…) You’re a smart kid. She’s hugging you with her heart. Hang in there. Happy Mother’s Day to you both! Thank you, Phil! If you are a mom, Happy Mother’s Day to you too! Thank you, Pam. And thank you for being there for all I am going through with Mom. It is a sad situation, but I wanted to capture what I learned from my mom and celebrate the relationship we once had. Love the photo. Sorry to know that your mother has faded away, but she has left you with some wonderful wisdom. And being the good daughter that you are, you’ve shared it with us. Thank you. And have a Happy Mother’s Day! Ya, love my 1970’s Farrah Fawcett hairdo! It does look like we were having fun together tho, doesn’t it? I think Mom would love the list I put together. If she is with it enough next time I see her, maybe I will read the list to her to see what she might add. I haven't had my mom to celebrate Mother's Day for four and a half years. I too try to remember the good times when she was still with us. Yes, best to remember the good times because the current times stink. And the only change that will happen is for her to get worse. Rather than dwell on that and be maudlin, I decided to celebrate what she gave me. I’m sorry your mom is not with us but it is lovely that you have your memories of her. I bet even tho you can’t call her, you still have conversations with your mom, right? Being a mom to kids with paws is an important job! And those kids with paws are quick to forget when we make mistakes. How wonderful that you talk to your mom so often. She is a lucky woman to have such a caring daughter. Happy Pet Mother’s Day to you! 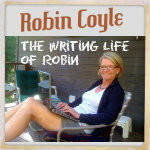 Remember the good times, Robyn, my dad went the same way, in the end he looked like a small child, all innocent eyes and pursed whistling lips — a little birdlike man from one who was of medium build and strong. It’s sad. But I do remember him as he was, my adored dad, love him forever. Interesting that you say that . . . Mom is very childlike now. Wide-eyed with wonder at times, throwing a temper tantrum at times, stubborn at times, or following along like an obedient child at times. I’m so sorry about your dad. How lovely that you have those memories of him. How difficult it must be for you and your family to see your mother like this. You raise a great point about the loss of empathy as part of the disease process and to not take it personally. But that is far easier said than done, especially when one is used to unconditional support and praise from a parent. Happy Mother’s Day to you too, Robin. I wish I knew/understood what was happening to her all those years ago. Then I would have had empathy for her condition. Dementia is cruel . . . you look perfectly normal on the outside. One thing I tried to say here and then deleted it because it was a ramble, is that before she was completely gone, she knew something was wrong but didn’t know what it was. It made her angry and scared and not pleasant to be around. I wish I had known that too. My poor dad and what he has been through with her. At least by writing about it and educating others, you may help someone down the road who finds themselves in a similar situation.